A rose by any other name would smell as sweet… and a rose by any other name would taste as sweet, too. Eating roses might sound a little odd to our modern palette, but they’ve been used in culinary applications for centuries. Roses were first prized for their medicinal virtues; early on, they were used as an astringent for skin ailments. The petals were used in rosewater and cream as early as the first century AD. Believe it or not, rose hips are actually a good source of vitamin C. During World War II, when citrus was not commercially available due to shortages, the British government sent people out into the countryside to gather rose hips from wild hedgerow roses to make into syrup. Roses first came to the West from Persia in 1240 by way of French Crusaders. The first known cultivated rose is Rosa gallica var. officinalis, also known as the apothecary rose. I had an extensive herb garden in England and I owned the apothecary rose. I loved it so much that I planted it on my farm here in Indiana as soon as I could. It’s a joy to see and smell it in bloom. I use the petals for various things: potpourri, bath fizzies, bath salts, rose water, and cooking. The petals are lovely in salads, but what I really like to do is candy them and make rose sugar. How do I describe the flavor of candied roses? The best way I know is to say that they taste exactly how a rose smells. It’s a floral essence that releases on the tongue a moment after you chew it. A candied or sugared rose gives the petal some texture and a sweet crunch. Since my apothecary roses are in bloom right now, I thought I’d share two of my favorite historically-inspired preparations with you. Dip a rose that is neither in the bud, nor over-blowne, in a sirup, consisting of sugar, double refined, and Rose-water boiled to his full height, then open the leaves one by one with a fine smooth bodkin either of bone or wood; and presently if it be a hot sunny day, and whilest the sunne is in some good height, lay them on papers in the sunne, or else dry them with some gentle heat in a close roome, heating the room before you set them in, or in an oven upon papers, in pewter dishes, and then put them up in glasses; and keepe them in dry cupboards neere the fire. You may prove this preserving with sugar-candy instead of sugar if you please. Now, I do not possess a bodkin or a close roome, and the recipe is a bit involved for me, so I adjusted the method, which appears below. Note that you should always choose undamaged petals from roses that have not been treated with pesticides. All of my herbal books suggest gathering the petals in the morning when they are most fragrant, but I’ve gathered them at all times of day and I’ve never noticed a difference. Sugared Rose Petals can be used as edible decorations for cakes, puddings, candies, cookies, and pastries. 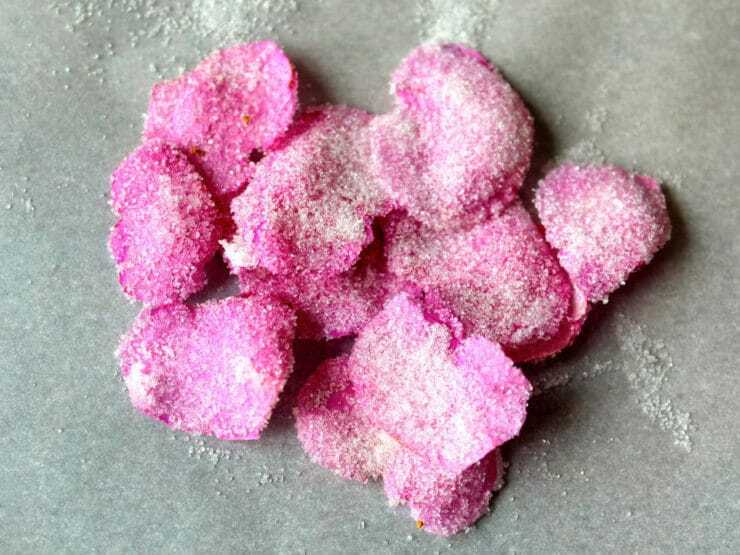 Rose Sugar can be used to flavor pastries, cookies, and confections or sprinkled over their tops. Stir the rose-infused sugar into tea, lemonade, or anything you’d like to give a slight rosy flavor. It’s particularly nice sprinkled on top of scones and shortbread. Roses are beautiful to look at, but they have so much more potential. Gather ye rosebuds (petals, in this instance!) and enjoy these old fashioned rosy treats. Make sure your rose petals are organic (pesticide free). Remove the bottom white tip of each rose petal and discard; the tips have a bitter flavor. Assemble your supplies. 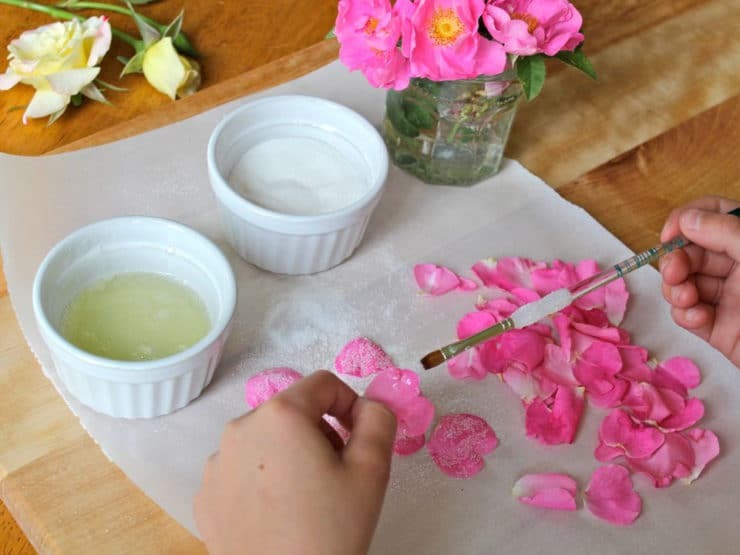 Paint both sides of each rose petal with the egg wash, simple syrup, or prepared meringue powder. 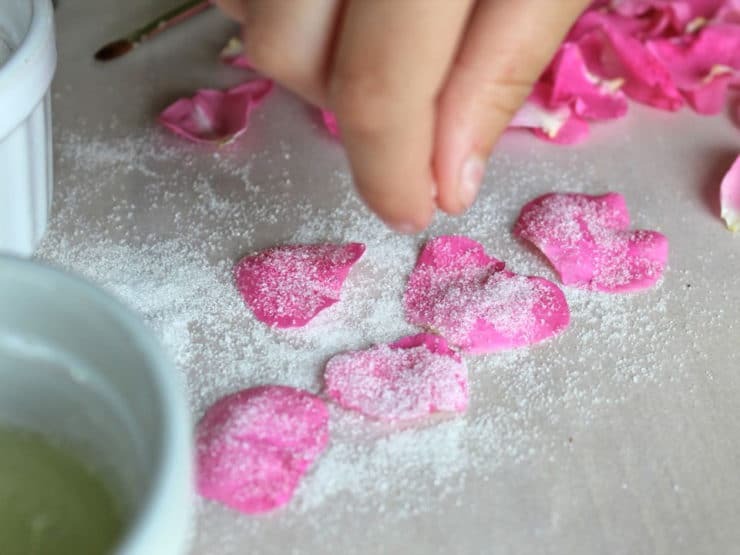 Sprinkle the prepared petals in sugar on both sides. 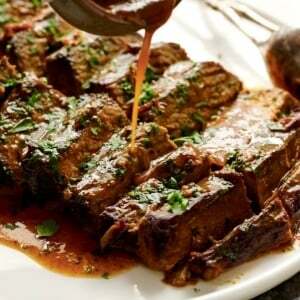 Set on a piece of parchment paper or wax paper and let dry overnight. 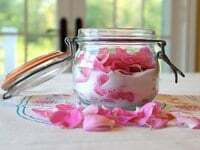 If you use simple syrup, the petals won’t hold their shape as well as they do with the egg wash.
Use your candied petals as edible decorations for cakes, puddings, candies, cookies, and pastries. If you don’t plan to use them right away, store sugared petals in a freezer. Make sure your rose petals are organic (pesticide free). Remove the bottom white tip of each rose petal and discard. 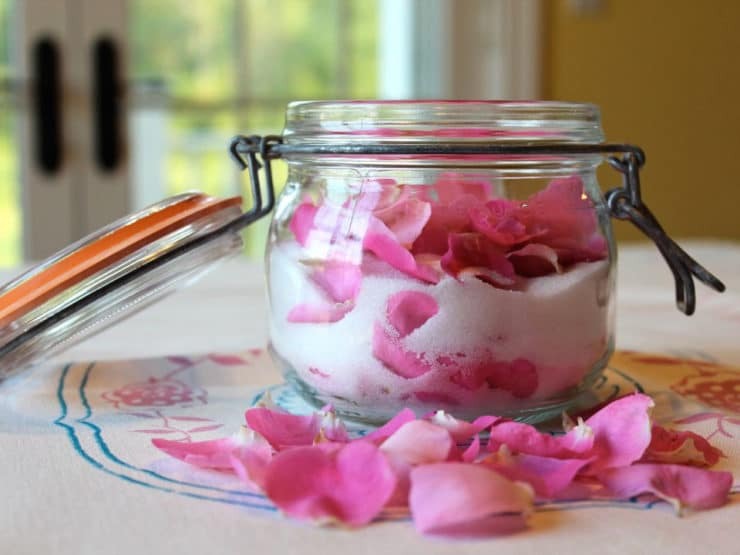 Sprinkle sugar on the bottom of the jar and sprinkle a layer of rose petals over it. Layer more sugar and rose petals until the jar is filled. 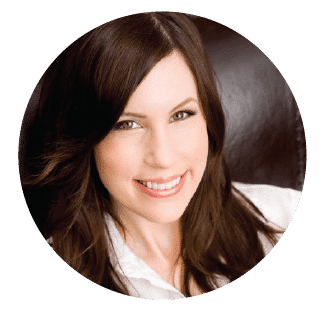 Store in a cool, dark place (such as your pantry or cupboard or "close roome") for several weeks. When you open up the jar you’ll be met with a rosy perfume. You can remove the petals before using. 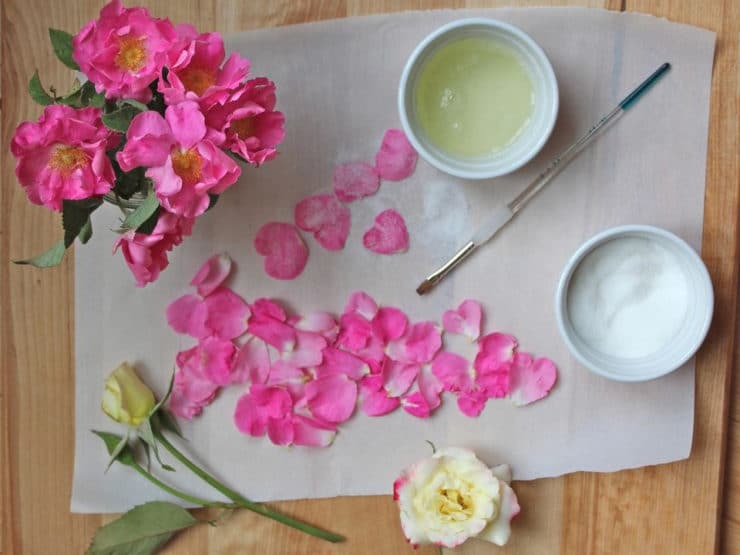 Use your Rose Sugar to flavor pastries, cookies, and confections or sprinkled over their tops. Stir the rose-infused sugar into tea, lemonade, or anything you’d like to give a slight rosy flavor. It’s particularly nice sprinkled on top of scones and shortbread. A lovely rose for these recipes is one called Isfahan by David Austen Nurseries. I lived in Isfahan for several years and there was a rose there very much like this one .My mother in law said one day in the garden this rose is called the rose of Lodon !!! Eggbeaters and their ilk are essentially pasteurized egg whites, so that’s another cheap easily available alternative to meringue powder. I’ll have to try this next year. Would the rose sugar work with dried rose petals? I have an abundance of dried culinary grade rose! Hi Victoria, we’ve never tried this method with dried roses. My guess is it would depend on how potent/fragrant your dried petals are. They need to be strong to transfer the natural “perfume” into the sugar. It’s worth a try! Why not just add rose water to the sugar? I made this a few days ago, but have run into a moisture problem. I did as suggested, layering rose petals with sugar in a glass jar, closed it up, and put it in a dark, cool pantry. After a day moisture began to show on the inside of the glass and the rose petals started to just smell “fermenty”. I dumped it all in a wide, shallow bowl to try and quickly dry out the moist, mushy mass before serious ferment kicked in, but what went wrong? The roses were picked late morning after several days with no rain. They were dry to the touch when I worked with them. Not enough sugar? Should I sieve it out after a day? Can one use the sugared petals to make the rose sugar also? Hi Tamara! The little hands in the photo belong to my 12-y-old friend Gracie. She lives nearby and helps me with the farm. She loved painting and sugaring the petals. It’s really a fun (and tasty) craft for kids. Yes, I have grown borage and sugared the flowers. Rose petals and rose hips too. Hi Sara, oh, what a great idea! I have a load of borage. I will try sugaring those. So pretty on a cake. Looking forward to reading Sharon´s novel when it comes out! I was just going to say that, Tori! The Apothacary Rose is very easy to grow. It’s a hedge rose so expect it to spread out. You’ve inspired me to plant an Apothecary in my own yard, Sharon. I just planted an Ingrid Bergman and a Sugar Moon last week, they’re so lovely. Nasturtiums in salads, yes. 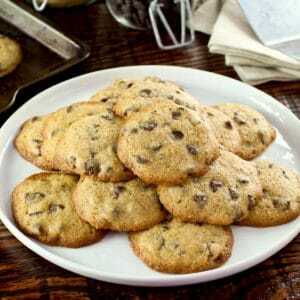 They´re kind of peppery. But Lavender tastes like soap, and rose petals have always had an odd aftertaste to me. Oh wow! this is amazing! Where would you find roses that are not sprayed with anything noxious so they are safe to use? Many people grow roses in their own gardens (I have unsprayed organic flowers in my back yard), so that would be the first place to check! Also there are some sources online for organic rose delivery, and sometimes Farmer’s Markets will have organic flower stands. Google and ask around to see what is available in your area. It´s gorgeous. Wasn´t aware rose petals were eatable.